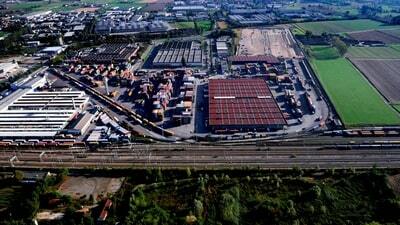 The railway junction of Melzo is an important hub for container movement which is located on the railway line Milan-Treviglio-Brescia and connects with both Genoa and La Spezia with both Rotterdam and many other destinations on the Corridor 24. Since the area of the hub can operate workers of many different companies it is necessary to dispose of a communication system for the emergencies that not must be dependent by personal devices. The requirement of the customer was to have a communication system suitable to connect immediately and in a simple and reliable way the personnel operating in the wide area of the hub both with a local control room both with a remote control room that in future will make the oversight of other similar systems. The dual purpose of this communication system is to let that the operators of the control room can provide instructions to the staff on field in case of emergency and, at the same time, that the staff on field can give immediate signaling of potentially dangerous anomalous situations to the operator of the control room. The proposed solution is to adopt a system that integrates on the same apparatus the public address feature and the emergency call feature as the SounLAN-E.UP321, that is an audio gateway Over IP produced by ERMES, that includes a 320W amplifier each of which controls 16 horn loudspeakers with 20W maximum power for the public address feature and, at the same time, an emergency call unit with a large red call button for the emergency call feature. 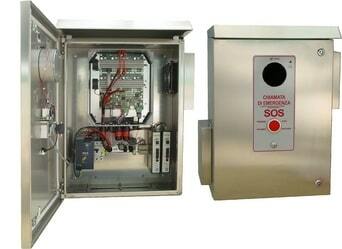 The gateway and the accessories elements as the power supply and the devices that make the data network have been assembled in a stainless steel cabinet for fixing on the pole that implements, thus, an integrated unit for public address and emergency call. The field devices are managed by two separate control rooms, the first is located in the same area of the Melzo railway hub while the second is located remotely in the Greco-Pirelli main control center where in future will be centralized similar systems installed in other railway hubs. The system is based on the new audio gateway Over IP produced by ERMES that is equipped with an built-in amplifier with output for 100V audio line that is available with 3 different output power levels: 80, 160 and 320W. Mainly, these gateways implement the function of public address Over IP by interfacing the LAN to a group of connected speakers to audio lines at 100V but, in addition, they can connect some external accessories that extend their use with some cool features. For example, thanks to the presence of an audio input that lets you connect an external 0dB audio signal generated by an external analog source, if you installed a public address system with background music in a hotel, you can use the gateway Over IP in order to implement a local amplification system in a room for conferences or entertainment activities. 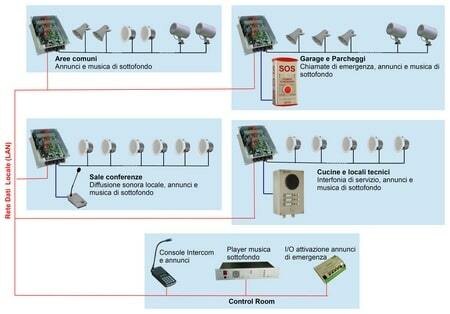 Another possible option, as in the case of the MELZO railway hub, is to connect a group consisting of button, microphone and speaker, to implement on the same apparatus both the sound diffusion function both the emergency call function. 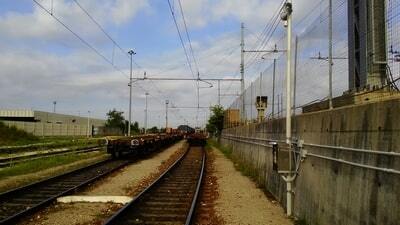 The Melzo plant consists of a series of tall poles about 6 meters installed along the tracks; at each pole is fixed a pair of horn loudspeakers oriented in the direction opposite to each other so as to spread the sound in both directions. 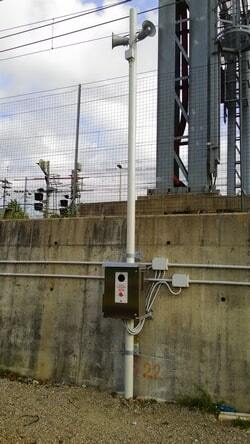 On a pole every 8 it is fastened a cabinet that contains the gateway where the horn loudspeakers and other equipment like VDSL modems are connected that enable you to connect the ETHERNET network even if the distance between the cabinets exceeds 100 meters. Moreover, the audio gateways produced by ERMES, thanks to the ability to connect a local audio source on their 0dB input and the ability to manage an emergency call unit, may provide an easy solution in order to solve many problem that you can find in structures such as large hotels or convention centers where the public address system with background music must be integrated with specific needs in some special areas. In fact, it will be very easy to add to the public address system with background music a local amplification system for conference halls or entertainment areas or to complete the gateway with a unit for emergency calls that can be used in the safe areas for disable people as expected for the hotels or the other structures with presence of public. Ultimately the SoundLAN-E.UP gateways are the best solution in order to integrate in only one apparatus both the public address systems both the emergency call systems.